Hasten now cross-labelled on 33 pesticide brands. Years of research and development by Vicchem to create technically-superior crop adjuvants, such as the flagship Hasten brand, is finally paying off for the science-based company. Since its Australian launch in 1994, Hasten has been cross-labelled on 33 leading pesticide brands, the latest being grass herbicide, Platinum360®, launched by Adama recently. The pioneering adjuvant brand has become a genuine home-grown success story for Melbourne-based Vicchem, due to growing popularity among suppliers, resellers, agronomists and growers. Vicchem’s national sales manager, Owen Connelly, said Hasten was one of the few adjuvant brands that could genuinely claim ‘Aussie icon’ status. Widely sold in the distinctive 20L green can, Hasten has a solid research base. It’s manufactured to high quality standards and extensively trialled to ensure safety to users, crops and the natural environment. "Adama’s launch of Platinum360 brings to 33 the total number of leading herbicides, insecticides and defoliants now cross-labelled with Hasten." From Vicchem’s R&D division, technical manager Peter Jones reminded resellers and agronomists of encouraging results from the company’s recent studies into adjuvant safety. Mr Jones said all adjuvants had the potential to cause crop phytotoxicity which plant chemists believed was due to cellular breakdown. "Based on our long term studies, canola-derived Hasten produced relatively less cell damage than mineral oil adjuvants, including Uptake and non-ionic surfactant adjuvants such as BS1000," he said. On environmental safety, Mr Jones said Vicchem had also studied the effect of these same adjuvants on beneficial insects and predatory mites. "Our results showed that Hasten was generally safer than the other two adjuvants tested, which can be harmful to predatory green lacewing, predatory mite and parasitic wasp when sprayed directly at typical use rates." Mr Jones said Vicchem was also exploring opportunities to use some of the outstanding properties of Hasten in the development of new products, tailored-made for certain pesticide types. "A key strength of Hasten is its ability to help systemic selective herbicides penetrate the waxy cuticle of target weeds - without damaging crops. "We are now trying to incorporate those properties of Hasten into new adjuvant products in a targeted way. "Ultimately, it’s about being more exact with the science and using novel ingredients to get the best result from every pesticide type and application scenario." 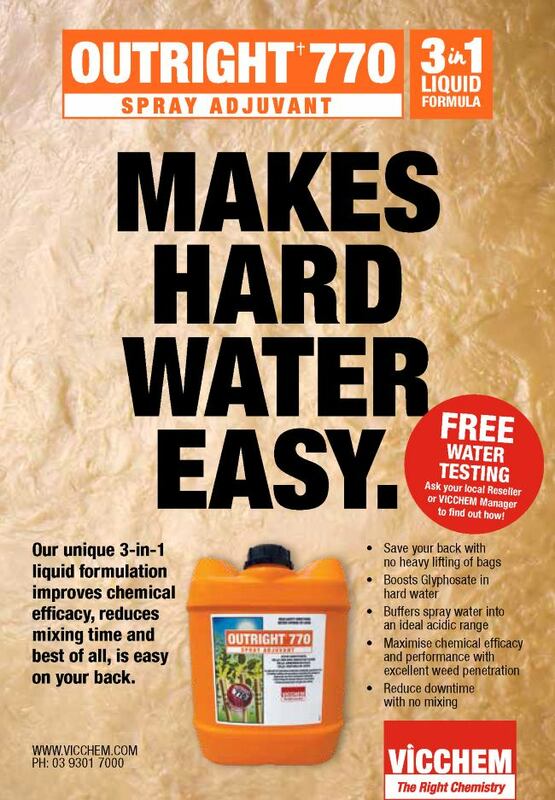 Hard Water is fine when the chemistry is right. PDF: Adjuvant effect on spray droplets. What are adjuvants, what types are there, and how do they work ?